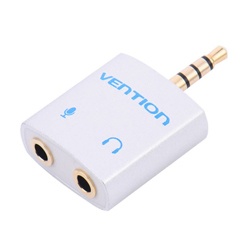 This simple audio adapter, manufactured by Vention Technology Limited in Hong Kong, is designed to plug into a 4-conductor integrated audio jack found on many new notebook computers and mobile devices and split it into the two components: stereo sound out and mono sound in. It is similar to other devices we sell on the site, but is compact and inexpensive. In our testing we have found this to perform flawlessly. To be clear, this is NOT a simple audio splitter to provide audio out for sharing between two users. Rather, it is a device to allow a user to attach a standard headset microphone (with separate 3.5 mm plugs for audio-out and mic-in) to a device that has only a single audio jack. Comments: We get these through AliExpress and offer them as an easy, inexpensive, and compact way to connect a headset microphone to your mobile device or notebook computer which includes only a single audio jack. These require a device with a 3.5 mm jack and will not work on Apple mobile devices (iPhone, iPad) with a lightning port. To use with these Apple devices, you will also need to use the lightning to 3.5 mm adapter that came with your device (or purchase it separately). Keep in mind that not every headset microphone is compatible with your mobile device and it will only replace the onboard mic on your mobile device if it falls within a certain impedance range.